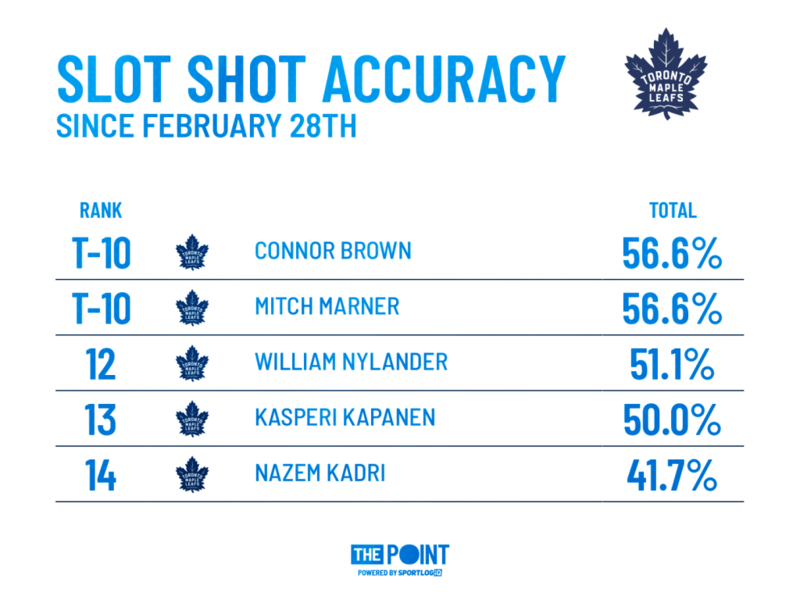 Leafs: Snakebit Trio of Nylander, Kadri, Kapanen Missing the Mark - The Point Data-driven hockey storytelling that gets right to the point. One week, they can’t keep the puck out of their net and the next, they can’t put the puck in the net. The Toronto Maple Leafs lost 5 of the 7 games they played in the last two weeks and with the playoffs, not to mention a 1st round date with the Boston Bruins, on the horizon that’s enough to have Leafs Nation feeling a little nervous. The Maple Leafs followed up a week where they allowed 23 goals in 4 games with a much better week defensively, however they’ve only managed to score 5 times in their last 3 games. A number of Leafs forwards are going through goal-scoring droughts including Willian Nylander (0 goals in 12 games), Nazem Kadri (0 goals in 11 games) and Kasperi Kapanen (1 goal in 15 games). So, what do the numbers say? Exactly the same thing. This trio is getting its fair share of prime scoring chances but they are missing the net more than anyone else on the team. In his 12 game goal-less drought, Nylander has had a ton of chances, firing 45 shot attempts at the net from the slot. Only 4 players in the league have more in this period of time. However, Nylander’s hit the net on just over half of his attempts. The only Leafs forwards with worse accuracy in that time frame, Kapanen and Kadri. As mentioned, Kasperi Kapanen has 1 goal in 15 games since Valentine’s Day and Nazem Kadri has 0 in 11. They have been, by far, the least accurate shooters among Maple Leafs forwards from the high-danger slot area. The chances are there, there’s no denying that. 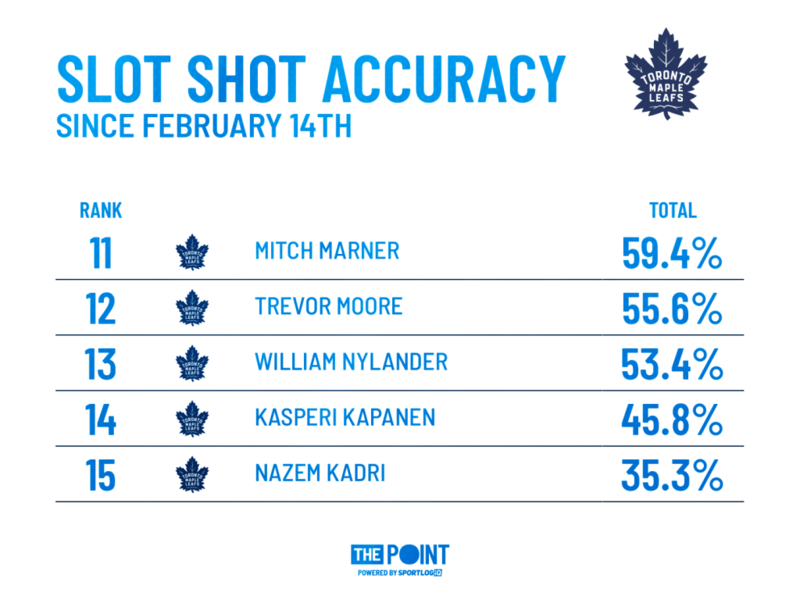 Since February 14th, Kapanen, Kadri and Nylander rank 4th, 5th and 6th respectively among Leafs forwards in shot attempts from the slot. The problem is, right now, too many are just that – attempts. The process looks good, the execution just has to be better. If Kadri, Kapanen and Nylander keep getting as many chances as they have been lately, once they start hitting the net with more regularity, the goals will come.